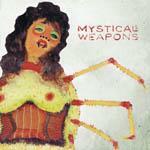 Mystical Weapons is an improvisational effort that had initially begun as an impromptu live collaboration between Sean Lennon and Deerhoof drummer, Greg Saunier. Born out of necessity, (Lennon simply needed a band to open a show for another of his projects, The Ghost of a Saber Tooth Tiger. Serendipitously, Deerhoof had been touring with The Plastic Ono Band, so Lennon tapped Saunier to help out. ), their creative partnership gelled as the two continued to perform sporadic live dates with visuals provided by filmmaker, Martha Colburn. Now, the two have an album. My immediate response to Mystical Weapons was to dig up just about every fusion based and/or experimental and spacy jazz album I could find that had been released during the 1970s. The Mystical Weapons language runs through the Lennon/Saunier cipher, improvisational conversations that border on the narcissism of jamming as well as the self-indulgence of spontaneous sound exploration (albeit “ahead of its time” sound exploration), finding much of its weight in 70s jazz fusion and even some of Neu!’s cosmic output. I found myself revisiting Mahavishnu Orchestra’s Inner Mounting Flame, The Leprechaun by Chick Corea, On The Corner by Miles Davis, Sun Ra’s Lanquidity, The Mothers’ Weasels Ripped My Flesh, reconsidering the tones and ideas based in that era’s progressive and ornate expression, an inventive effort that attempted to evolve an art form that had threatened a dead end, its absence of form at the hands of Ornette Coleman, Albert Ayler and John Coltrane difficult to surpass creatively. Mystical Weapons brought all this to mind: Lennon’s already well-established legacy combined with the playfully odd Deerhoof an interesting enough combination, the results a fascinatingly modern update to much of what I’ve already mentioned. You don’t hear a piece of music like Whispers The Blue Tongue without considering Miles’ Electric period, its funk-laden low end and the ensuing guitar squeals specific to that era and that musician. So, while this album inspired me to dig into my trove of 70s fusion albums for the purposes of comparison, it also impressed me on its own. Lennon and Saunier interact with kindred sensibility. Granted the improvisational nature of the live act isn't completely engaged for this album as it does sound mostly rehearsed and resolved. But, it comes off genuinely balanced. The Zappa-like guitar solo that announces a more dramatic section of the album’s opener, Impossible Shapes, somehow transitions perfectly into the playfully spacey rhythms and electronic Neu!-inspired wisps of Mechanical Mammoths. There’s fluidity here, even when a nonsensical vibraphone tantrum (Silk Screen Eyes) and a floating and minimal piano piece (Dirty) need to prop up an off-kilter, fuzzy noise track (Goddess Curlers) and an instance of lo-fidelity, gondola-addled romance* (Hostile Takeover). A quick and acoustically obscured string piece called Gilbert Releases His Pet Salamander into the Wild follows. One of the best moments of the album is Colony Collapse Disorder, which takes some of Zappa’s more anthemic melodies and builds around them a consistent and expansive take on what could be Neu!’s Weissensee. It’s just beautifully rendered, a lush and gradual expansion of harmonies and layers of sound. The following tracks, Distant City and Dirty Neon, both observe the band’s improvisational origins before leading into Gross Domestic Happiness, which sounds almost based in 70s funk and soul before it shifts into a pulsating and hyperventilating spate of kick drum and free form guitar sounds. The music collapses eventually and finds its stride in a heavy, flute-laced King Crimson informed outro. Consortium Musicum echoes Sun Ra and robotics, a series of synthesized tones calming the miasma of the previous track. * Believe it or not, this actually makes sense. ** For a very comprehensive and modern reconsideration of 70s era jazz fusion that doesn't qualify as indie rock, check out Fontanelle's 2012 release, Vitamin F.